The story initially centers on Hecuba as the central character, the former queen of Troy now held captive along with the rest of the women. Defeated, they are the only ones left from the previously great city. 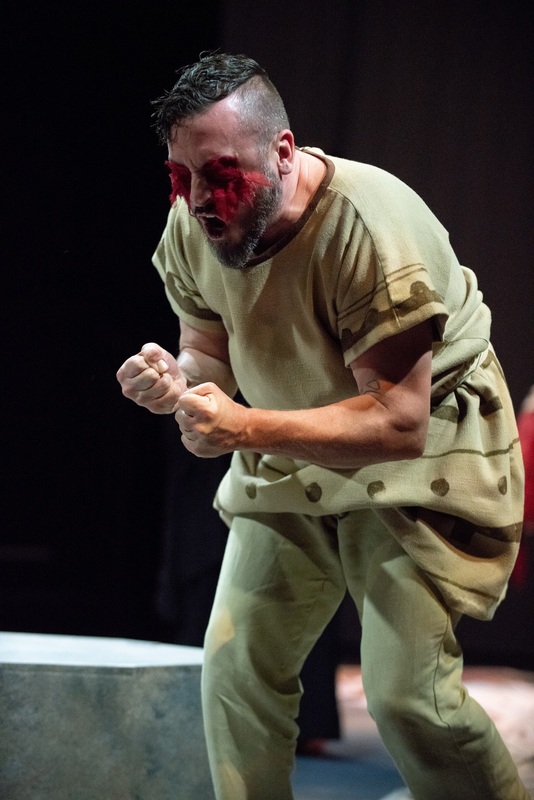 All have suffered loss of family members, but for Hecuba, her loss is the worst that a mother can endure, the loss of not one, but two of her children. She is surprisingly resolute, and with the help of a sympathetic ally, and a horde of women who have also suffered significant loss and persecution, she takes surprising and satisfying action. In spite of this heavy revelation, Helen’s cleverness comes to light early in her part of the story, and she has a flair for humor despite the tragedy of the situation. Connie Strayer’s set design is effective and polished with floor to ceiling fabric upstage forming screens that are primarily used for projections and also serve as a barrier to the backstage area. One of the screens doubles as an unexpected prop during a critical Act 1 scene. A small, movable wedge serves a multitude of functions as a platform, a gathering place, and various obstacles. Seating is on three sides of the stage area, the Roble Studio Theater being a spacious, converted gymnasium outfitted with air conditioning, full theater lighting, and reconfigurable seating. As a side note, the complex still appears as Roble Gym on Stanford campus maps due to a grant requirement when the building was initially constructed. Composer and sound designer Michael Keck created a masterful backdrop of sea sounds and original ancient-sounding music to enhance the action. The sound plot is ever-present and accentuated by projections depicting natural phenomena and locations expanding the story. The projections include gorgeous Nile river shots, exquisite sand formations, pyramids, and stellar phenomena, all of which were researched, curated, and presented by the video/projection team of Katerina Zacharia (image researcher), Nima Deghani (projection designer), and Stephen Hitchcock (projection consultant). Lighting designs by Michael Ramsaur and Catherine Teitz focus audience attention and add to the dramatic sweeps. 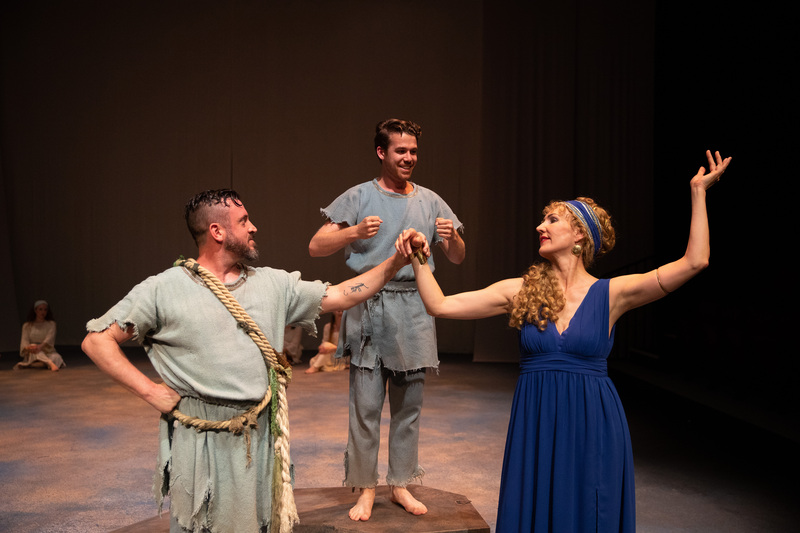 At the press opening, Rehm described the Greek Chorus as being very useful in telling a story. In his view, it has far more flexibility than any specific character. He relates it to the greater community that can at times be omniscient and at others can be oblivious to potential outcomes. It can bring emotion to bear in ways that an individual cannot. 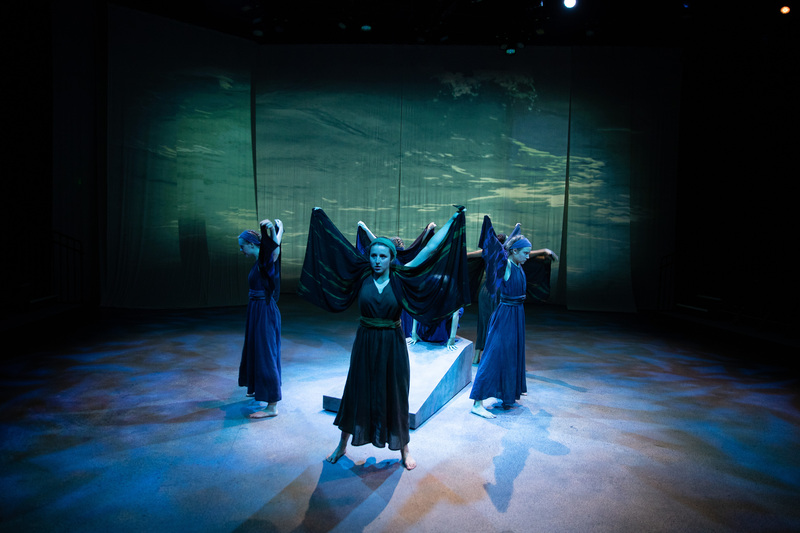 In Hecuba/Helen, the Chorus consists of seven women (two of the members of the Chorus take on additional roles at different points in the story) including Jennie Beck, Gianna Clark, Regan Lavin, Amber Dale Levine, Brenna McCulloch, Emma Rothenberg, and Lea Claire Zawada. The Chorus uses voice and movement to tell its portion of the story. At times, it gracefully takes the entire stage executing flowing dances to emphasize the story the being told. At other times, it is situated on the sidelines, ever watching, providing captivating commentary in song and verse. For much of Aleta Hayes’ choreography, tight synchronization is required, and although there is occasionally very slight phasing of a unison motion, stomp, or clap, the overall effect is impressive. 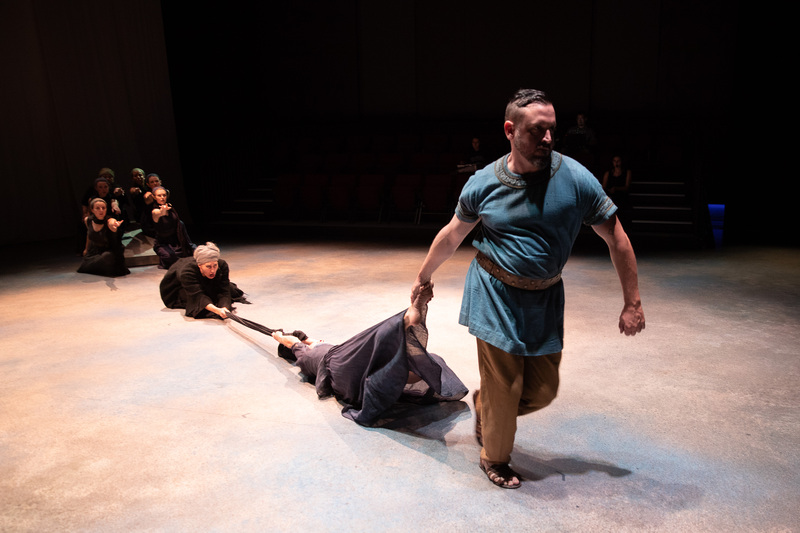 Joe Estlack takes on three significant male lead roles including Odysseus and Polymnestor in the Hecuba portion of the story, and in Helen, her husband Menelaus. Estlack’s performance is intense and even acrobatic at times employing some impressive tumbling moves. 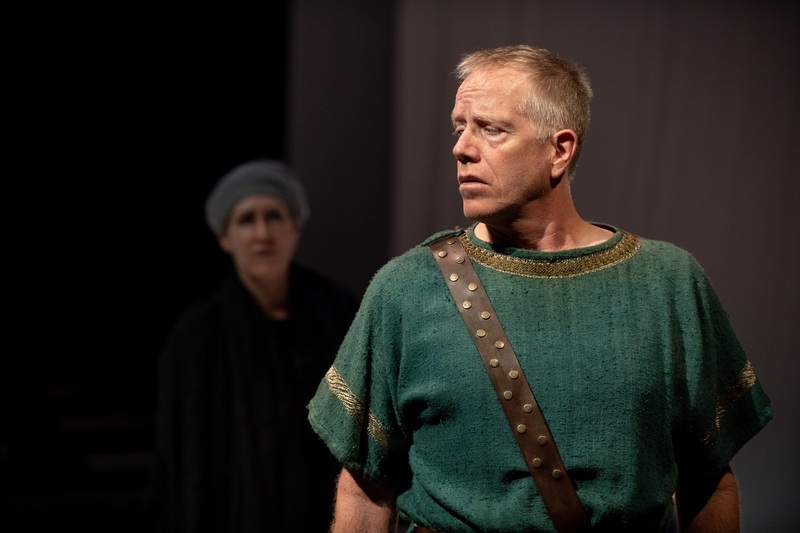 Doug Nolan is Agamemnon and Theoclymenus, both sympathetic, if dupable characters, important to Hecuba’s and Helen’s plans respectively. Along the way, Nolan employs some of his specialty skills with some snazzy sleight-of-hand woven into the story. The remaining cast includes Shayan Hooshmand, Benoît Monin, and Brennan Pickman-Thoon in featured supporting roles. Stanford Rep is known for their unique takes on challenging works, and this year’s production continues that tradition. The classics have survived through the years because of their relevance across the ages, and Rehm is a master at teasing out the lessons while providing engrossing entertainment. Don’t miss this production. Info: See http://www.stanfordreptheater.com, call 650-725-5838, or email StanfordRep@stanford.edu.